What’s It Like To Be Gay In Jamaica? Jamaica is a dream destination for many, but it’s something of a minefield if you’re gay. Sadly, homophobic laws from the colonial era are still in place, making life difficult for LGBT Jamaicans. Things are, however, slowly improving. 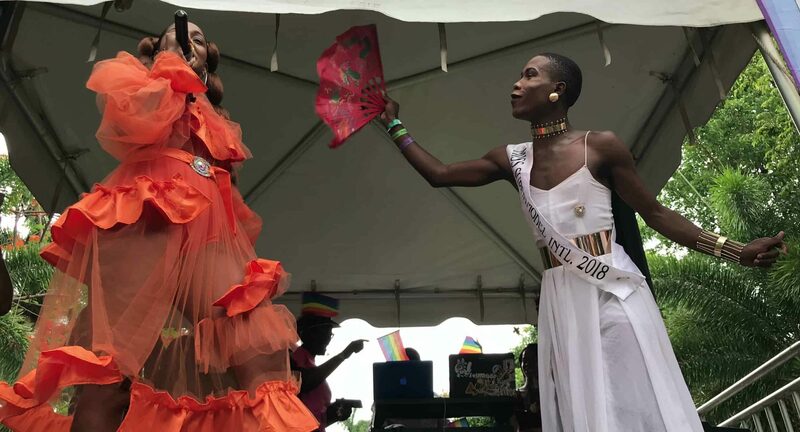 We caught up with Suelle Anglin and Jaevion Nelson, Executive Director of J-FLAG: a campaign group for LGBT rights based in Jamaica. Jaevion and co have been fighting for gay rights for over two decades. It turns out that gay life in Jamaica isn’t quite as hidden as you may think. Jamaica has had a pretty bad reputation in recent years for homophobia. As LGBT individuals on the island, what is the reality? Over the years, we have received and documented many reports of human rights violations from LGBT people from across the country who have been discriminated against, bullied, physically and sexually abused/attacked, kicked out of their homes and communities, denied employment or promotions, threatened, and denied services, among other things. However, despite how commonplace these incidents are, there is no single experience for LGBT people who live here or those who visit. The human rights situation is nuanced. Your experience is in many ways influenced by where you live, work, worship and socialize, how you look, who you know, how you talk, what you do, etc. Put simply, it often depends on how people perceive you. Consequently, LGBT Jamaicans who belong to more upper and middle-class communities and those who have social capital, regardless of their socio-economic background, do not experience homophobia in the same way a person from a poorer community would. What advice do you have for LGBT people thinking about visiting Jamaica? It is important to do your research about LGBT friendly spaces that are available. Homophobia, a legacy of our colonial past, is perpetuated on different ways in the society especially given the intertwined relationship between the state and religion. Visitors to the island are, however, usually spared from the homophobia and transphobia as quite a bit of work has been and continues to be done with stakeholders in the tourism sector. In 2017, the minister of Tourism, Edmund Bartlett, made reassurances that LGBT tourists are welcome to visit the island and will be safe in Jamaica. Public displays of affection not commonplace in Jamaica, regardless of one’s sexual orientation. Are things improving? You hold regular LGBT events, don’t you? Though there are still challenges, there is some progress. LGBT Jamaicans are in their own innovative ways navigating spaces and using their agency to build new realities and narratives. Though we do have quite a lot of events, over the years a vibrant LGBT entertainment scene has emerged. Special mention must be made to a group women promoters who have used entertainment events to reclaim music and spaces and also created safe spaces for LGBT Jamaicans to enjoy our culture. Tell us about Jamaica Pride. Pride in Jamaica has grown tremendously from its first known staging in the early 2000s to the first publicly held week of events in 2015. PRIDE plays a crucial part in J-FLAG’s work to reduce stigma and discrimination. Between August 1st – 6th a week of events runs in tandem with the ‘Emancipendence’ celebrations to support the LGBT community. The week of events includes an opening ceremony, a faith-based event, sports day, health and wellness fair, conference, a family fun day, concerts, women’s art events, breakfast parties and beach parties. During the week an average of 3,000-5,000 people attend. What will it take for mindsets to change in Jamaica? There are 8 key indicators that link directly to the improvement of the Quality of Life for LGBT Jamaicans. ● LGBT citizens must have full equality before the law. ● Teaching about sexual orientation and gender identity in schools is essential for the development and progress of any society. ● We need to see government-sponsored actions that work towards increasing the safety of LGBT persons and broadening their social acceptance and inclusion. ● Increase trust between the LGBT community and the Police. In contact with LGBT persons, the police officers will be professional and they must not be guided by negative stereotypes (this is already coded in the Jamaica Constabulary Diversity Policy). ● Media Organizations organisations need to be encouraged to promote a culture of respect and tolerance towards LGBT people. ● The Jamaican Government will need to further support dialogue and cooperation between governmental institutions, tourism organisations, the tourism economy and the organisation of civil society. ● The Jamaican Government has espoused an unequivocal commitment to respect universal human rights, and Jamaica is a signatory of international instruments governing this issue. A lot of homophobia still exists in Jamaican music with dancehall viewed as particularly problematic. What steps are being made in the music world in Jamaica? Although there has been no quantitative research of which we are aware, there has been a recognizable decline in the prevalence of homophobic content in modern dancehall music. Of course, the older music continues to be played in dancehall spaces, however, given Dancehall’s social function as a stark reflection of Jamaican culture and values, the shift in Dancehall music is expected to organically continue as attitudes towards the Jamaican LGBT community incrementally become less harsh. Also, slurs are not allowed to be played on public airwaves and monitoring by the Broadcasting Commission continues to maintain this standard. High profile activists such as Brian Williamson, Steve Harvey and Dexter Pottinger have been murdered in recent years. Do you fear for your safety? Jamaicans are resilient people and LGBT advocates and activists are no different. While there are obvious concerns about safety and security, we do not allow that to impede the important work we have to do to improve the human rights situation in the country. Precaution is taken to ensure everyone is safe. It is important to note that Dexter Pottinger was not an activist. Dexter was an icon, a role model and friend to many people in the LGBT community. Information provided by the police did not point to his death as a homophobic murder. While there is still high levels of antipathy, much has changed in Jamaica. Williamson’s murder was over a decade ago and can hardly be considered recent. So while safety and security are always factored in the decisions and actions of individuals and organizations within the LGBT community, the varying levels of fear which subsist do not cripple the vibrancy of the movement or the community. Over 80 percent of Jamaicans believe that homosexuality is immoral, according to Human Rights First. Do you see that number improving any time soon? These statistics speak to the high level of religiosity in Jamaican culture, but should not be viewed in isolation. In 2012, the national survey on homophobia found that a third of Jamaicans believe the government is not doing enough to protect LGBT people from discrimination and violence. In the same survey, we found that though employers have reservations about hiring an openly LGBT person, the majority of them would not fire them if they found out they are LGBT. Tell us about the work that J-FLAG does to raise awareness and help LGBT people in Jamaica. J-FLAG uses a multifaceted strategy to promote respect for and inclusion of LGBT people in Jamaica through its reliance on public education and awareness raising, advocacy, activism, capacity building, community engagement and mobilization as a part of efforts to make Jamaica a more hospitable place for LGBT people. Finally, Jamaica clearly has lots of beautiful tourist hotspots – what are your favourites? Among the places we frequent and absolutely love are beaches, hotels, eateries and parties. These include Treasure Beach, Alice’s Crab & Corn (by Heroes Circle in Kingston), French Man’s Cove, Royalton and Jewels Runaway Bay. Out Of Office can hook you up with J-FLAG approved LGBT tour guides in Jamaica.